Blogs are deceptive. Not content-wise, but style-wise. They look like a normal website, but work in a weird way. It didn’t used to matter to me, because I never read them; but now that I write one it does make a difference. This primer is to help you navigate around my blog, but it will help you get around others also. I think of it as a public service. Can you make your way around the blog without this primer? Of course. And if you are a guy you wouldn’t ask for directions anyway, but hey, I’m here to help. Honey-Dear, didn’t we just pass this gas station a few minutes ago going in the other direction? The Group of Posts View – result of clicking on a category/tag or from a text search. The is normally the default view you get arriving at the blog’s “Home” page. 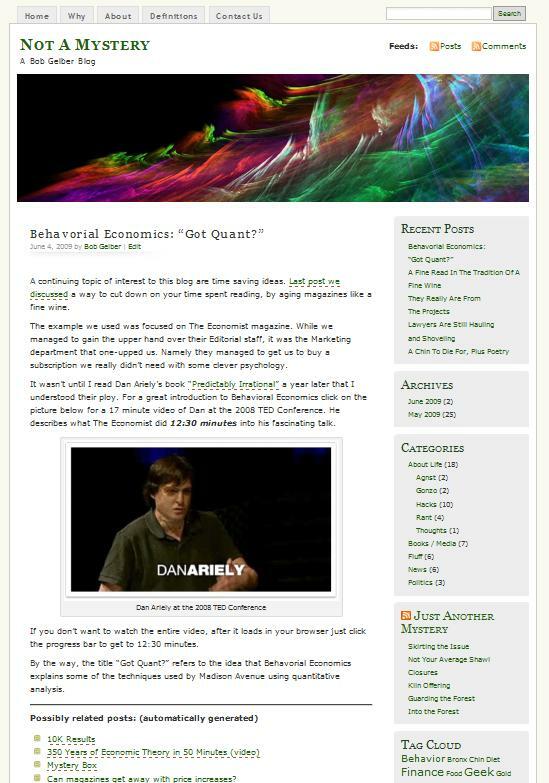 It’s all posts in the blog with the most recent at the top. It felt upside down to me until I started to write a blog. The reason it works is that a blog is like most relationships: ‘hey, what have you done for me lately‘. Like the results of a google search, most of us really only look at the first few items. If the most recent post was all the way at the bottom of the list you’d never get to it, and I would never be doing anything for you lately. So that’s the reason for the ordering. When you get to the bottom of the first page there will be a link to ‘older’ or ‘previous’ posts. Clicking on this will take you to the next page and older posts. You can keep going like this, until you get sick of the exercise or run out of posts. So far so good, you are still browsing in the All Posts View. As you peruse the posts you have a few options. You might want to leave a comment, or the post might only show the beginning of the article, with a link for ‘more’ or ‘continue reading’. For either of those options you would click on the appropriate link for that post, and jump to the Single Post View. When you make that click to ‘comment’ or ‘continue’ you enter the world of The Single Post View. It might look the same as the All Posts View, but you’re really not in Kansas anymore. If you scroll the page up and down, you’ll see that there are no longer any posts above or below the one you are viewing. By the way, if you’ve gotten this far you are now in the Single Post View! Look around. You are looking only at that single post. Looks pretty much like the All Posts View, doesn’t it! Down at the bottom you will see some new links and place to add comments, so it’s different when you take a close look. Go ahead and leave your (intelligent, respectful) comment, or read the rest of the (intelligent, insightful) post. Afterwards, you will want to get back to the All Posts View from whence you came. The best way to get back to where you were is to hit the Back button in your browser. An alternative to going back to the All Posts View is to branch off and explore one of the categories or tags associated with the post you just read or commented upon. 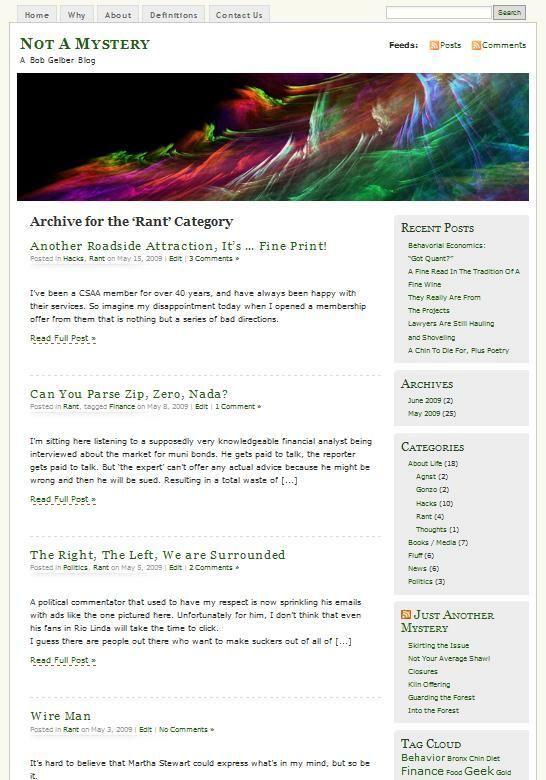 Perhaps you were reading a post that was categorized as “Rant” and wanted to see all the other Rants on the blog. You would now click on the “Rant” category (or tag) link and the result will be a Group of Posts View. The Group of Posts View is pretty distinct. In my blog you will get what looks like a search result listing. At the top of the page it will say something like “Archive for the ‘Rant’ Category’. Then you will see the first few sentences of each post in the list, and a link to open the entire post. When you click the link, guess what, you are now back in a Single Post View. You could leave a comment or go back to the Group of Posts View and then on to the next item on the list. As before, the best way to back out is your Back button multiple times to re-trace the breadcrumbs you dropped on the way in. In some other blogs you can get hugely confused, because the Group of Posts View will list each post in it’s entirety rather than just a summary. You may very well think you are looking at an All Posts View, and you are not! This is one of the main reasons I chose our blog format, as it minimizes this confusion. Comments – The ‘upside down’ rule (where the most recent Post is at the top of the blog) doesn’t apply to the Comments attached to a particular Post; the oldest comment is at the top and as you scroll down the page the comments get more recent. Links To Other Sites – When there is a link to another site in the blog, clicking on that link will open a new browser window without shutting the blog window. This gives you a chance to explore that site without losing your place in the blog. Links Inside the Blog – When there is a link to another spot in our blog a new window will not open, to keep things from getting too confusing. A typical example here would be when you click on a graphic to enlarge it, or there is a link to another post. This leads to the next suggestion. When In Doubt Use The Back Button – In general when reading a blog the quickest and easiest way to get back to where you were is the Back button in your browser or the Backspace key on your keyboard. The Home Page – The Home page is the page you arrive at when you first come to the blog, with the most recent post at the top of the page. You always can return here by clicking on the “Home” tab at the top of every page, or on the name of the blog in the header at the top of each page. That’s about it for reading a blog. Doesn’t seem like much, but hopefully it will make a simple process simpler, and your navigation easier. In our next Blog Reading Tip we will expand on our knowledge of blog Navigation and delve into creating and sending Links to your favorite blogs and posts; plus finding your way when you Land on a new blog.